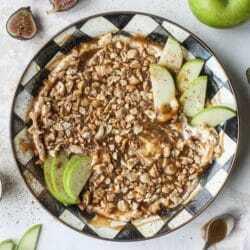 I’m feeling super 1992 with my caramel apple dip today! And it’s technically my second dip of the week, but it’s so warranted. Give me ALL the apples! If you haven’t figured it out by now, this is my take on the old school caramel cream cheese apple dip from the 90s. Or 80s. Or whenever! I think I ate it most in the 90s. This is kind of like how I updated my mom’s veggie pizza. I wanted to give it a slightly more modern twist. Something fancy. And make it even more DELISH. Our creamy base is simply mascarpone, sugar and vanilla. I could eat that stuff with a spoon. It’s a freaking dream. Just go ahead and spread it on a cracker while you’re at it. The caramel? It’s my bourbon caramel and it is INSANE. Slightly salty, bourbony caramel ribbons on top of that mascarpone is basically everything I want to eat in the fall. Or at least – dip my apples in to. On top, I did some chopped roasted cashews instead of the regular peanuts that usually blanket the caramel. Oh my word. It is SO GOOD. It’s rich, so you only need a little bit. 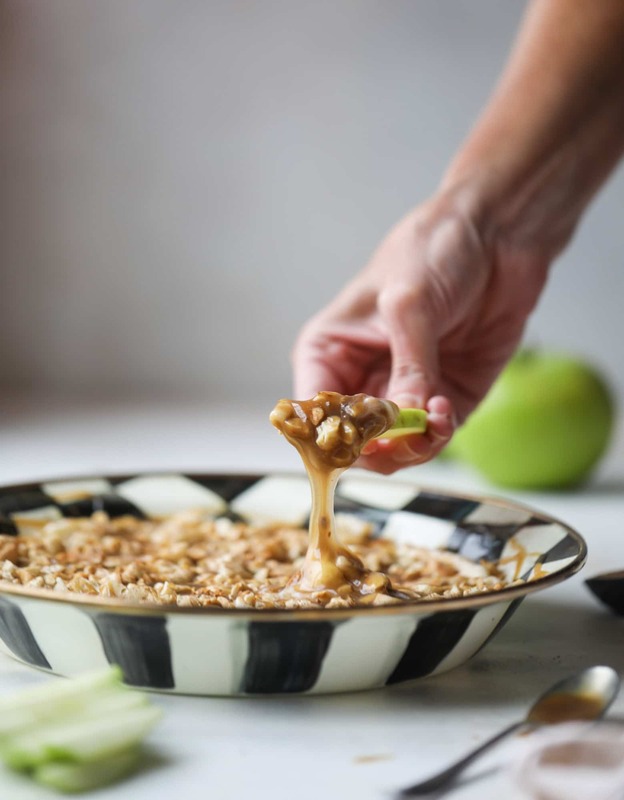 This dip also reignited my obsession with granny smith apples. I’ve eaten one every single day and the tartness is just perfect. I’m mostly a honeycrisp or gala girl but those green ones… ooooh. Something about them is right on par with the flavors right now. And they are tart enough that they cut the sweetness of this dip, which is… let’s just call it: dessert. Also just trying to figure out if we can make this breakfast or a snack. Yes? Bourbon Caramel Mascarpone Dip is an amazing appetizer or dessert. The creamy base is simply mascarpone, sugar and vanilla. Topped with slightly salty, bourbon caramel ribbons. Slice apples and dig in! While the caramel is cooling, stir together the mascarpone cheese, sugar and vanilla extract until combined and smooth. Spread it in an 8 or 9-inch pie dish. Place it in the fridge for 30 minutes. By this time, the caramel should be close to room temperature. Pour the caramel on top of the mascarpone layer and place it back in the fridge for 1 hour. After 1 hour, sprinkle the cashews on top. Add a sprinkle of cinnamon. Drizzle on the extra caramel if you'd like. Serve with sliced apples! Makes me happier than I can stand. Bring on the 90s deliciousness! I think this sounds INCREDIBLE!! And I think it would also be amazing with chopped up toffee chunks or the bits instead of cashews…or a combination of both!!! I love everything about this dip and can’t wait to make it! 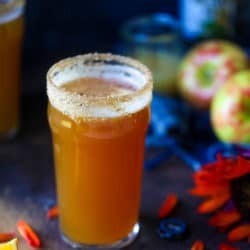 How can I make the caramel without the booze? Substitution? Is there something you could use on top instead of nuts? Or would it be ok to just omit them? Thanks!